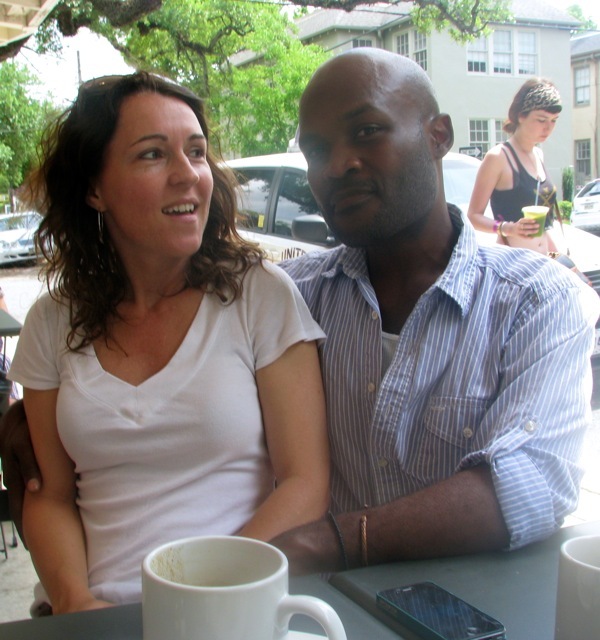 Kaya and Khari talk New Orleans, Katrina, and the connection that comes in times of crisis. Even though I write this from my picnic table at the Return to Freedom American Wild Horse Sanctuary in California — one of my favorite places to write ever – I’m letting you know about the posting of my second blog for Verge Magazine – which was written, naturally enough, in New Orleans. That’s right, more than a month, and at least three thousand miles, ago. After a military honor guard presented the folded flags to the family of the William S. DeMayo, actor Robert Gossett steps forward. 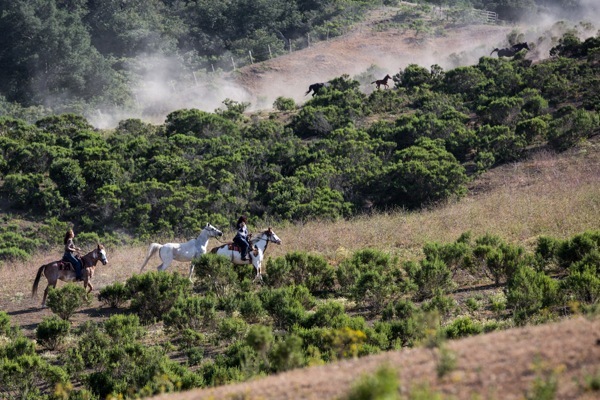 Wearing a celebrative white instead of more funereal shades, Gossett spun, waving a hand over the sprawling, rolling California countryside – also known as Return to Freedom American Wild Horse Sanctuary. A few minutes later, between testimonials from daughters Neda and Diana, the proceedings were interrupted by two folks on the fringes of the crowd – a pair of horses who had broken into boisterous whinnying. “That’s Bill!” someone shouted amid the laughter. 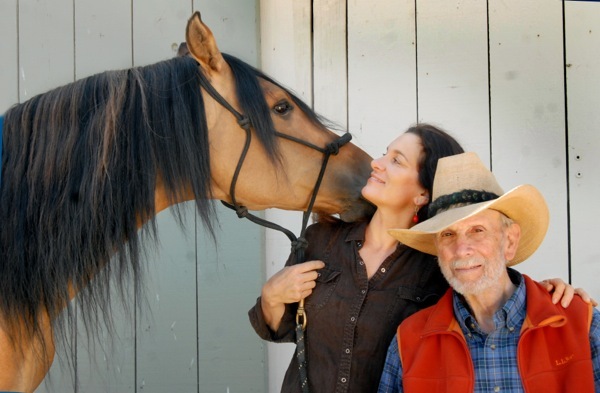 Two decades ago, when Bill De Mayo was a mere lad of 73, who would have thought his life would take the East Coaster out here, on a horse sanctuary he would help his daughter found on the California coast? After earning four bronze service stars and two oak leaf clusters as a bombardier in World War II, Bill had returned to his native Northeast and build a career in accounting, rising to partner in the firm of Ernst and Ernst (now known as Ernst and Young). He was not particularly known as a horse person, but his daughter Neda definitely was. As a girl, she’d seen a documentary about the abuse of wild horses; unlike many of us, she had retained the passion to do something about it into adulthood. Determined to found a sanctuary for wild horses, she was evaluating a variety of West Coast sites when her father began contemplating retiring to California. Then they discovered the 300-acre spread in rural Santa Barbara County, in a region with the promising name of Point Conception. The family decided to sell their securities to buy the land. 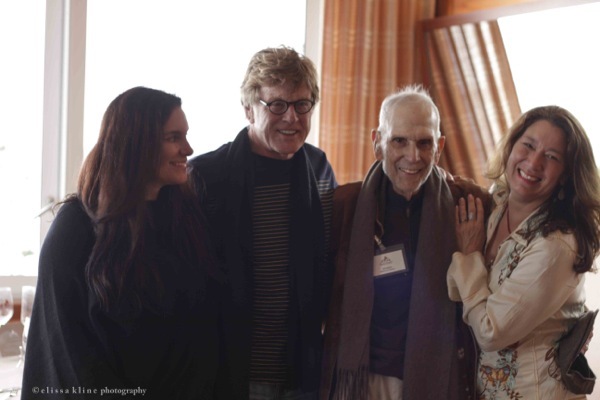 Under Neda’s leadership, Return to Freedom flourished, recruiting such supporters as Robert Redford and Carole King. Even one of their horses is a star – Spirit (seen above) was the model for the Dreamworks animated film Spirit: Stallion of the Cimarron. The song was fitting for reasons beyond the timing. Since arriving here at the ranch four days ago, everyone I’ve talked to about Bill DeMayo – from family and friends to the staff – talked about his relentless optimism. You can add to that his relentless generosity, which, one friend of his told me, was the source from which everything else here sprang. Without even meeting the man, I have benefitted from that virtue. Return to Freedom has put me to as good a use as any agency on this two-month road trip. I’ve cleaned gutters on the office and the barns, thrown clumps of hay at (and occasionally onto) horses and burros from a moving cart, and mucked corrals and stalls, sometimes near the horses who had produced the manure I was gathering. (Along the way, I discovered that while academics occasionally refer to clerical work as “shoveling s–t,” the actual activity is, surprisingly, preferable to paperwork.) Finally, I owe Bill for the nights, walking to and from my cozy cabin under a starry sky devoid of light pollution, the only noises those from horses, coyotes, birds, and other creatures of the night. After two months on the road, this place has restored my spirits even as it’s worked my body. There’s a lovely calm amid the hustle and bustle, a cordiality amid the scores of tasks that keep the horses fed and the ranch running. Back in Tuscaloosa some unknown thousands of miles ago, a dear friend, Margaret Cooper, told me how her own volunteer work comes out of gratitude for how good people have been to her; Return to Freedom joins the long list of places where I’ve seen that dynamic in action. As Neda said at the service, “My dad, he was always grateful, he never expected much, and he was so glad for the gifts he had received.” Last year, in a Father’s Day blog, Neda compared her dad to “the rugged stallions who guide their herds to food, shelter and safety” – as well as someone who helped her every step of the way toward her dream. When the sharing on the patio is over, and Peter Crowheart and his fellow musicians have performed the Native American song “Soldier Boy,” Neda saddles up and leads a riderless white horse most of the way up a ridge. Once we all catch up, there’s a Chumash chanting ceremony in which each of us is blessed with the smoke of burning sage and the pressing of an eagle feather to our foreheads; the horses are included in this rite. Many of Bill’s ashes are spread along the spine of the riderless horse, the rest remaining in a bag Neda holds once she mounts her own horse. Then she leads the Arabian up the ridge, her father’s ashes trailing them in a cloud that settles into the sanctuary he helped create. 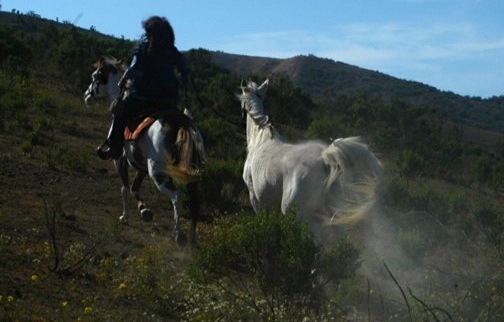 We watch as she, her sister Diana, and, of course, Bill ride up and down the ridge, eventually working their way along a crease.We’re not the only ones watching: Opposite us, a herd of wild horses line up at the fence line, then take off almost parallel to the riders – kicking up their own cloud in seeming tribute. We whoop then, and again later, as the two sisters come trotting back up the ridge, grinning amid grief, celebrating the man who made this moment possible … for all of us. 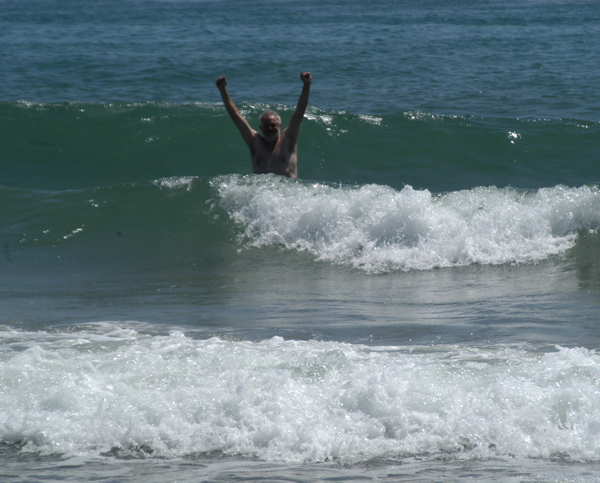 On the 52nd day of the community service road trip, Serving the Story finally splashed down in the Pacific Ocean – specifically the beach at Carpinteria, just south of Santa Barbara, California. Karena Ryals took this photo – in a most unlikely example of good karma, this time I got to be the one picking up a friend at the Burbank Airport. I hope to post on my latest service adventures – including Best Friends animal shelter in Utah and a volunteer ranger on the South Rim of the Grand Canyon – in the next day or so. Meanwhile, the good folks at Verge Magazine have granted me space for a second blog about my journey, with different material from what I provide here. To read the first entry – and enjoy all the intriguing features of Verge – try this link.